No, I have 15 ft of chain and 150 ft of line. I know they say to cleat it off, however I have never done that. In rougher water I let all of the chain and 150 ft of road out until I see the bitter end pull on the line, now the bitter end has all the tension on it. In calmer waters I let out what is needed to hold her in place, I've had no issues so far. On an open bow it may be ok, but on my girl standing on her deck in 3-4 ft waves retrieving her anchor does not appeal to me, been there, done that. Deck cleats were / are never ment to take the strong yanking for hours in a storm. Neither are most anchor windlass gear systems. A stuck anchor in high seas is a terrible choice to have to make very quickly. A good reason to have the last few feet of anchor line or chain to be something you can safely cut......easily....... with a knife. I cut mine in the center of the very tight line. That way when it whips apart. The 2 ends whip very powerfully away from my hand..fingers ...holding that sharp blade loosely. 2 times I wish I had a longer sword of about 2 or 3' long. 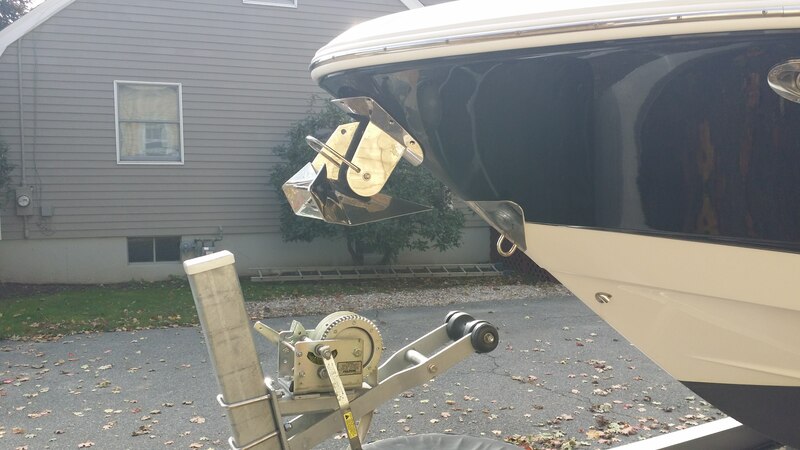 It is bad enough to use the anchor motor constantly in a effort to get free in calm water. Over heats it easily. Add in wind and 5' plus waves breaking on the bow. The yanking on the windlass, motor & electrical parts are out of sight. SEVERE OVER LOADING. That also includes the SURFACE where the windlass is bolted to. 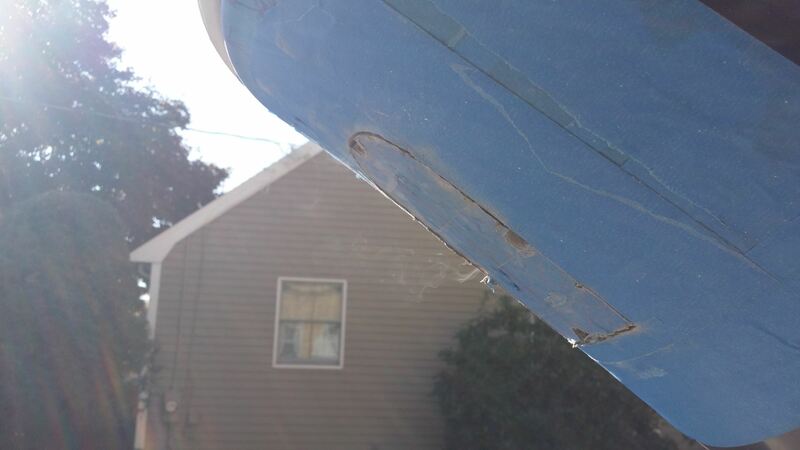 It can quickly start to develop hair like wide.............STRESS CRACKS ...........that go completely thru overly hard glass surfaces......................... We are constantly told to re assemble ALL cleats with massive backing plates to prevent the cleats from pulling out in storms at the dock. I am guilty of not always powering the bow directly over the anchor in a windy, choppy conditions. From a bridge it is almost impossible. But long STRETCHY braided line allows me to cheat a lot on a partially stuck anchor. Having a cranky starting engine in a sudden squall....10 minutes to 10' waves.... will qualify you to write your version of storm anchoring & a retrieval. Get lucky. Much better than wishing you had not gone out. Almost forgot about the reinforcing windlass backing plate. mount it & the plate on the opposite side of the surface on a flat surface. back of the locker if it can be reached from inside. If it is thick enough to take the strains. I like & do the bow deck. If curved ? Have to make 2 curved mounting pieces for outside & inside surfaces. Any material that water will not weaken or crush after thousands of yanks on them is fine. Interesting, that's cool. Yeah, I don' think I'll be anchoring in 3-4 foot waves lol. Bless you for doing that, but on the ocean, if you're amidst 3-4 footers, you need to go home immediately lol. It's funny I had some friends once and we went out fishing about 20 miles offshore and we couldn't even hold ourselves just to cast a line. I told them these are 3-footers let's get out of here. They asked me how I can tell just by looking at the water? I said I wasn't looking at the water, I was looking at the rise and fall of the bow! If you want to know what 3ft is, just imagine your kitchen counter height. All kitchen counters are exactly 3ft off the floor. So if your bow is going up off the kitchen floor to the top of your counter and back down lol, that's 3 ft. Anything around that and more is no anchoring zone as far as I'm concerned unless you've lost power and there's rocks or a wavy beach ahead. Then you have no choice but to use your anchor. I'll just use your thread to post the progress if that's ok with you. Might as well keep it all here. Have to do a lot of planning for this. A lot of templating, leveling, measuring etc. to be sure everything gets lined up correctly before making any cuts. 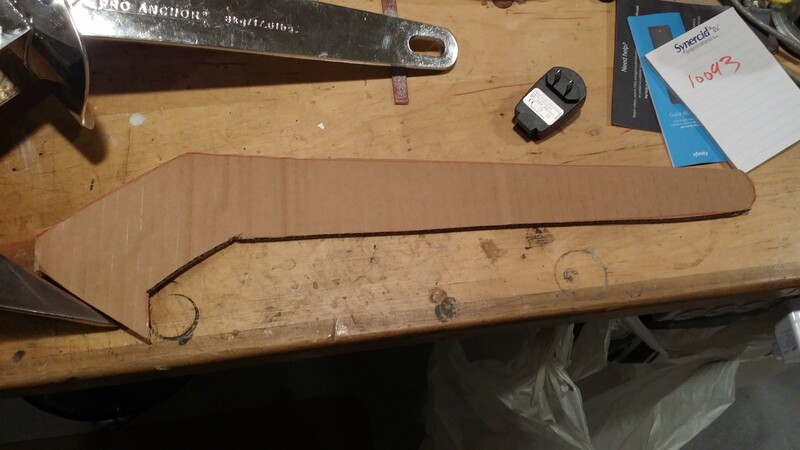 Made a template of the anchor roller out of heavy paper to shape it for contour and a template of the anchor leg out of cardboard to see how far inside the locker it'll end up. 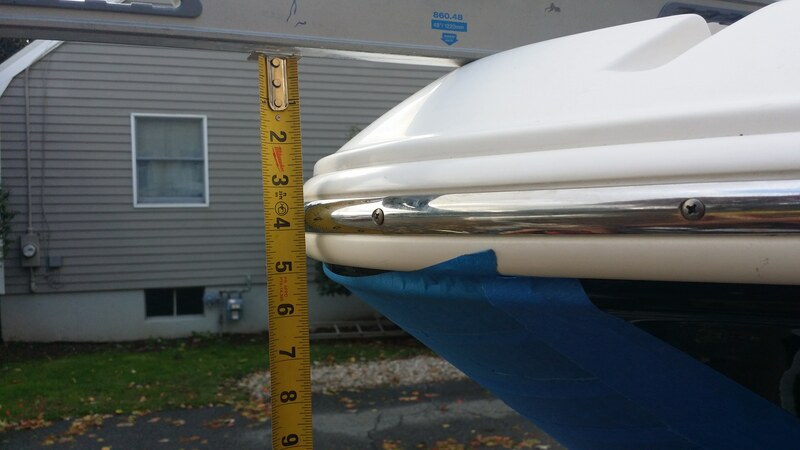 Ran a level across the highest point of the bow and made sure it's perfectly level (didn't have my laser level which would've made life a lot easier) and measure to the bottom of that inside ladder platform where the top of the anchor leg will come in, add 1/2" for clearance and it came out to 5-1/2". Transferred that measurement to the bow. Obviously that's really high on the bow and if I did that, the top of the flange on that roller plate will be sticking way up. So it'll have to go lower but at least now I know that the top of the anchor leg will clear the bottom of the inside ladder platform. Needed to figure out how far inside the locker that leg was going to end up. Lined up a scrap piece of cedar with the angle of the bow and marked the level angle off the level. Now I can put it up flush with the roller plate and the anchor at the same time and that will give me exactly the position of the anchor as it will end up sitting on that roller. 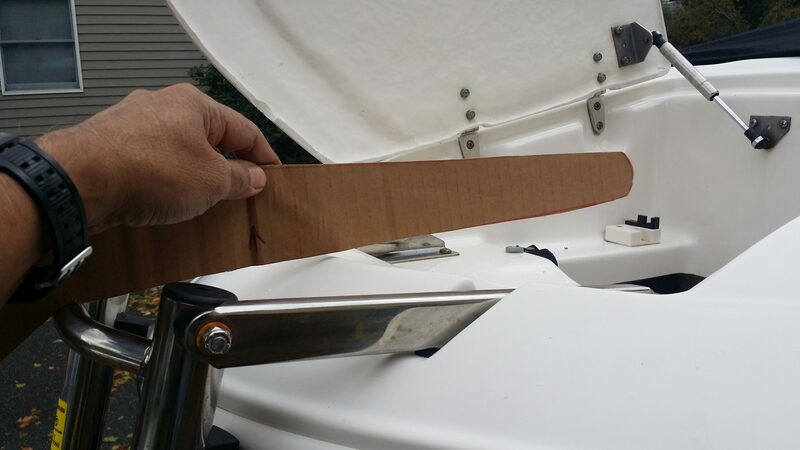 Then I can measure from the back of the cutout inserts on that roller plate (which are probably very close to the thickness of the hull) to the back of the anchor leg to get the measurement of how deep it goes in. It was exactly 12". So 12" brings it right to the end of that ladder platform which is a good thing since it's tight in there and I need some room for some space between the gipsy and the end of that anchor leg. Now for the roller positioning. Had to determine center line of bow. So I decided to take the center of the anchor locker since that HAS to be centered to the bow at the Chaparral factory.....right? lol. I did check it with other points and it's within 1/8" which I made corrections to. 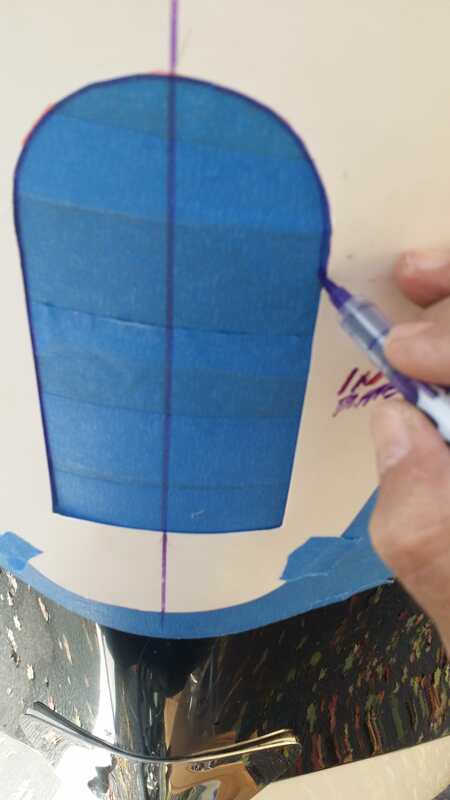 Then transferred the mark onto the blue tape. Center point off the bow eye for the keel center. I checked it using a couple other ways also then marked it. Connected the top center mark to that bottom point and marked the centerline. Placed the top of the anchor roller template and lined it up with the top line measurements I had determined to clear the bottom of that ladder platform and with this center, keel line and marked the cutout for the opening. Double-checked the location of the roller with the ladder out and I actually have 1/2" clearance from the top of that containment ring. Now I just have to cut it out which I will should could maybe do today. Great prep. Hope the hole goes well. Thx, Curt. 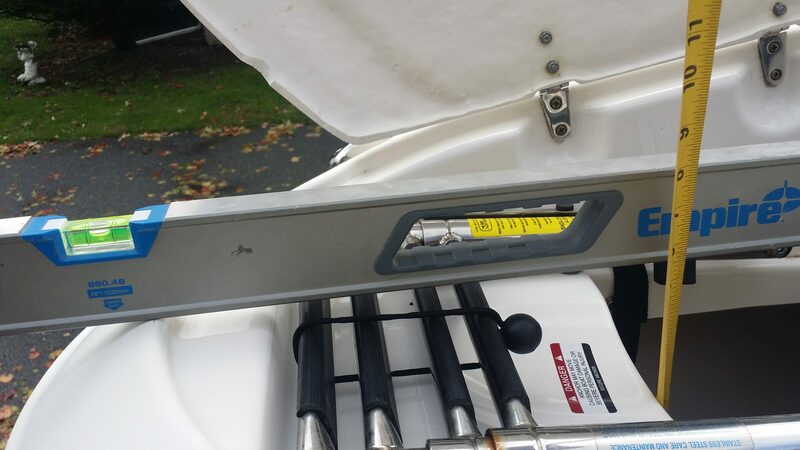 BTW, using the level to get the correct transfer distance of the bottom of the ladder platform to the bow will not work unless the boat is sitting on the trailer at the same angle it would be when it's in the water. I forgot to mention that point and to do that is very difficult unless you have some guide to determine that angle. In this case for me, I was fortunate that I had the bottom paint line to go by. So I adjusted the trailer using a 6'-6" level along the top of the bottom paint line and got it sitting level. Just a small but important little detail to consider. Yep, when as close as your’s is. Another way is the angle and height of the swim platform. 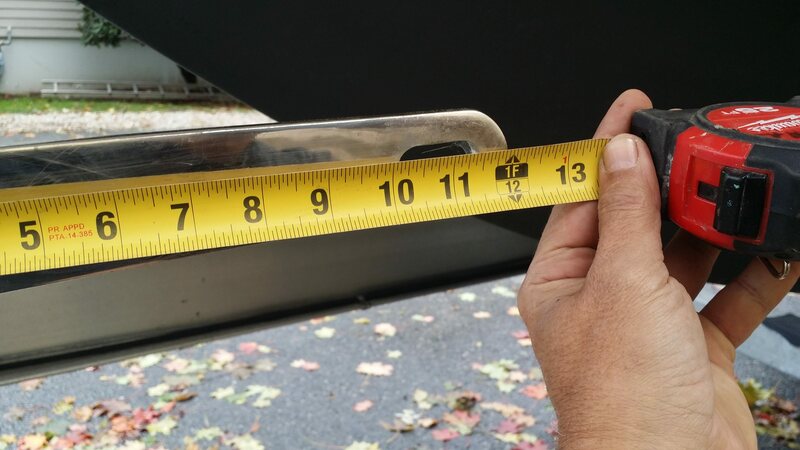 what is the distance from the bottom edge of the metal rub rail to the top of ur hole cutout? if so will the layout handle this? That distance came out to around 4-3/4" maybe 5". Drilled my starting holes with a 3/8" forstner bit since they drill super clean without chipping. But man, I knew that area was thick when I drilled an exploratory hole with an 1/8th" bit and it kept going and going and going. I had to keep checking inside to be sure I wasn't missing something. 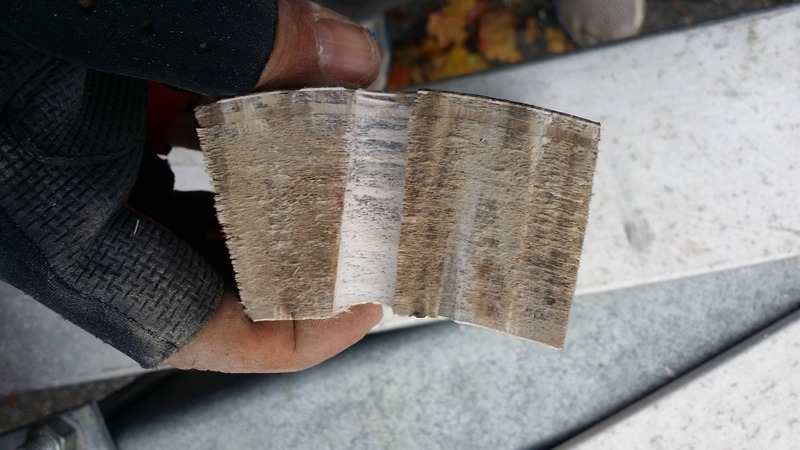 Turns out the bottom of that cutout is almost 2" thick hull material. Went through 7 jigsaw blades and at one point it was burning up. Not sure if it's the Kevlar causing that much hardness to the material or what, but there's definitely some interesting layers of materials you'll see in the pic below of the edge of the piece that came out. I worked my way downhill with the jigsaw and let gravity assist my cutting, takes a little bit of the shoulder strain and pain away. I drilled center, starting holes and not corner ones in all the runs so that I could cut into square corners instead of having the round corners of drilled holes. You get a more finished cut from the start that way. I can still smell the burning material. One thing for sure; you have to wear goggles (not just safety glasses) and a full respirator (not those cheapo masks) because this stuff is super dangerous. The little bit that got on my skin was worst than the fiberglass insulation that pokes and itches for hours. This stuff felt sharper since it's actually glass and you DEFINITELY don't want it in your eyes or lungs. 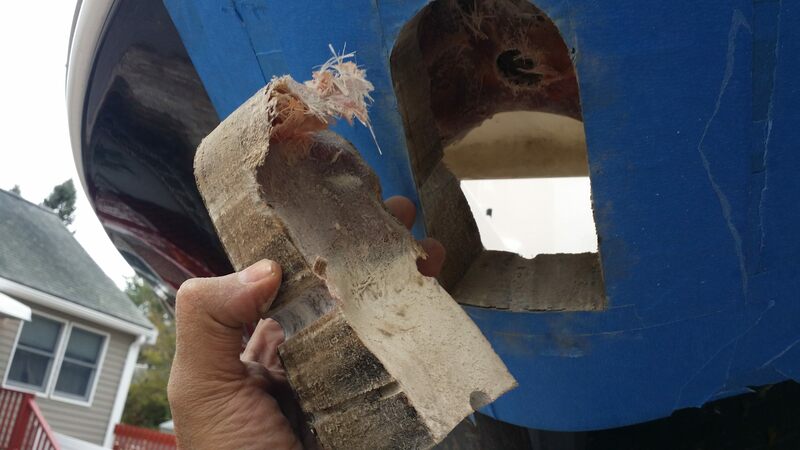 Better yet, set up a fan on a ladder nearby and have it blow the dust shavings away from you as you drill and cut. Interesting to see the layers of buildup and how thin the gelcoat actually is. Then I had to grind out the sides to get the appropriate angle for the recessed flange on the roller. Used my Foredom flexible rotary tool with a coarse drum bit and then a sanding drum. 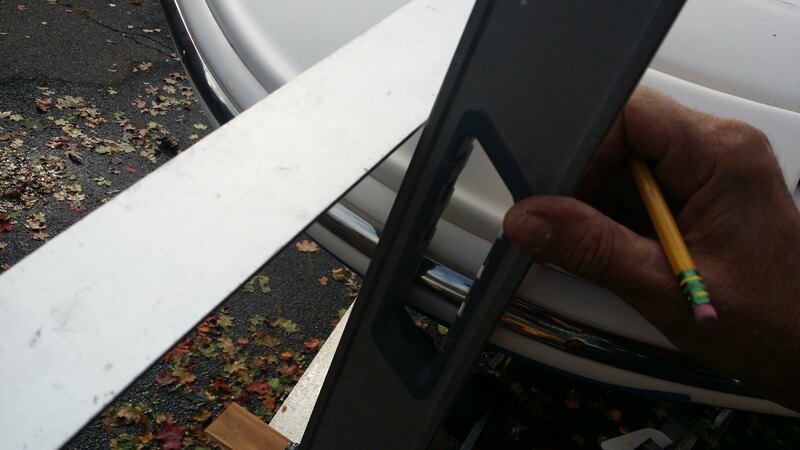 This step is much easier to remove the material than cutting it. Strange but familiar phenomenon. Dry fit and I'm very happy with the result. Toughest part is over. 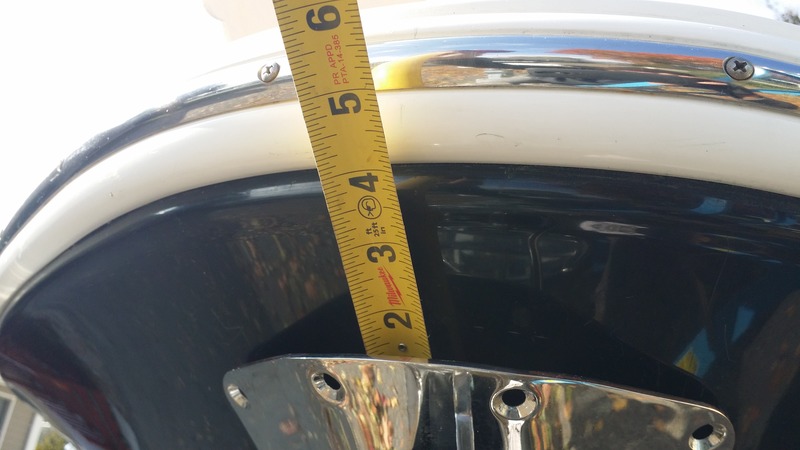 And I have my 1" ladder clearance which is exactly what I figured and it will end up being more once I flare out the stainless steel flanges on the roller to accommodate the shape of the hull and that roller sits nice and flush on the hull. Other than that, very happy this part is over! Funny you mention that. 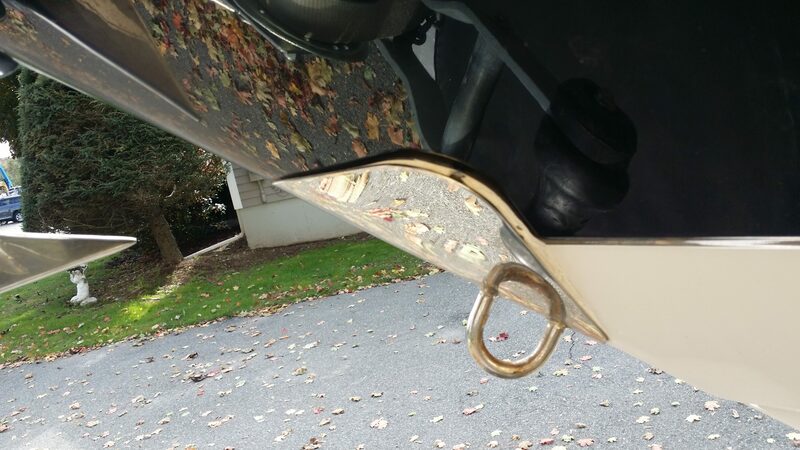 I wish I had a rope in that little hole when I got the original anchor that came with the boat caught in a lobster trap line and my son and I fought it for almost an hour and couldn't unhook it! We had to cut the line and lose it and that really pissed me off. Once I bought this anchor, I bought this little setup (I forget who told me about it, I think it was @Big Fun) and I've used it a couple of times. Works great. 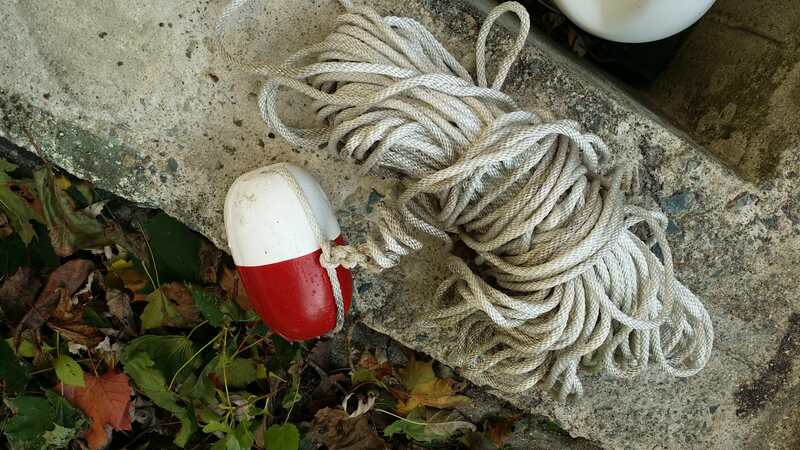 You tie this 3/8" line to that front top little hole and that buoy at the end of it, drop the anchor and that buoy floats and if your anchor gets caught and you can't free it with the end line, you pull this line and it pulls the anchor from the front and unhooks it from anything. Not sure what I'll do with this windlass here, but I might tie this off to it if we're anywhere near those gaddam lobster traps, that's for sure. Wow, well done. That's one big a$$ hole! Great, great job, and a 2nd on the big ___hole. Have you thought about sealing the cut out with something? Looks fairly porous, but pictures can be deceiving. Agree with Curt about resealing the raw surface with some sealer. Run some tape around the edges. To keep any rundown from leaking past the bottom of the opening . 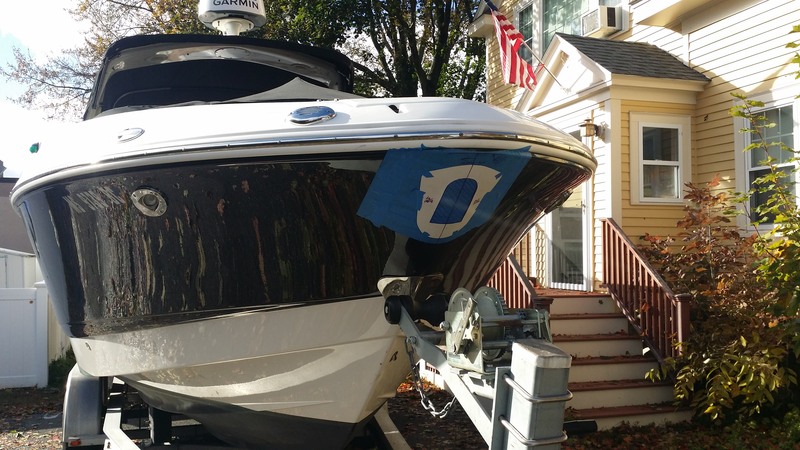 Just enough sealer to prevent wet glass hull hole freezing up & splitting apart during the winter. You could coat that inner hole with some thickened West Systems epoxy. I'm glad you were referring to the hole and not the dude cutting it. You know what it's similar to? Ever see the edge of Formica laminate? Take 30 layers of that and glue it together and the edge thickness is what this stuff reminds me of. It's super hard material and even though I'll cover it with something, I bet it would last forever just bare and exposed since it's basically fiberglass. If you look at that pic of the edge profile, notice the black finish gelcoat (it's about 1/2 millimeter thick followed by another 1/2 mil of white primer (I think) and then there's about 1/8" fiberglass matting and then there's that one, mysterious 1/8" layer of something very solid. You can clearly see it in that cross section and I'm really curious if that's the Kevlar or something else. That one layer is unusually thick compared to the rest of that material which is just layer after layer of matting and glass they applied. I was also going to run a 1" thick platform of some material, either starboard or even Azek and glass it into the bottom of the inside of that opening all the way and fasten it to the back of the bulkhead of the locker to mount the windlass on top of it and motor hooked up underneath it like that guy did in that video, but now I'm thinking of doing something different. I don't think a full platform is necessary at all. The anchor leg doesn't need any vertical support since it's positioned and held by the tension of the windlass. So that platform is really only for the gipsy and the windlass motor. So I'm thinking all I really need it to fabricate either just a bracket or a shelf mounted on the bulkhead with a support brace. As long as it's bolted/screwed in tight, stiff and strong, it should do the job. That way the locker is not obstructed and access to the chain and rode for any reason is much easier and no platform in the way. I'm also thinking of taking that windlass apart (which I already did) and mounting it to a drum. I think it's actually very doable. The back of the roller plate will get filled with 5200 when I squeeze it on, same with the holes for the screws or bolts. Originally I was going to use a 1/4" thick x 1" wide SS plate -- one on each on the inside -- with drilled holes lined up with the ones on each side of the plate and use them as large, combined washers to tighten the roller onto the bow. But now that I see how thick that @#&#036;%@# is, I'm just going with round washers for each bolt. No need to overkill it with that thickness. I'll probably end up using the Adtech filler epoxy paste and mix black color in it. @Hatem I have to tell you, I just read these last few posts over my morning cereal and I hope my cereal stays down. It was like reading a suspense thriller until I got to the giant hole. I commend you, now way I'd have the stones to do that kind of cutting. Can't wait to see it finished. I would NOT use any 5200 type of glop. That stuff is crap if you get a speck anywhere it should not be wanted. If you slide the piece into the hole & some gets into the inside of the line rubbing area ? Nasty clean up / out in that tiny opening. If it sticks to the slide in housing ? Then sets up hard ? You will need a torch flame to heat the housing up to remove the housing. For the back of the roller plate. That is the out side shiny one ? I would not use anything gooey that firms up at all. Removal WITHOUT bending that plate up would be pure luck. Scratching the hull with screw drivers & pry bars is a real possibility. I would buy a piece of closed cell, I side ONLY, adhesive backed ,gasket material. That will allow simple easy on & off removal at any time . Small pilot holes in the gasket bolt places should seal around the S S bolts going thru it. It comes in loads of thicknesses & stiffness. Ick your color. Thick the foam onto the back of the plate first. Stick it to the center of the plate BACK SIDE, FIRST. Then slowly peel the paper off as you work the gasket outward. Then trim the edges. 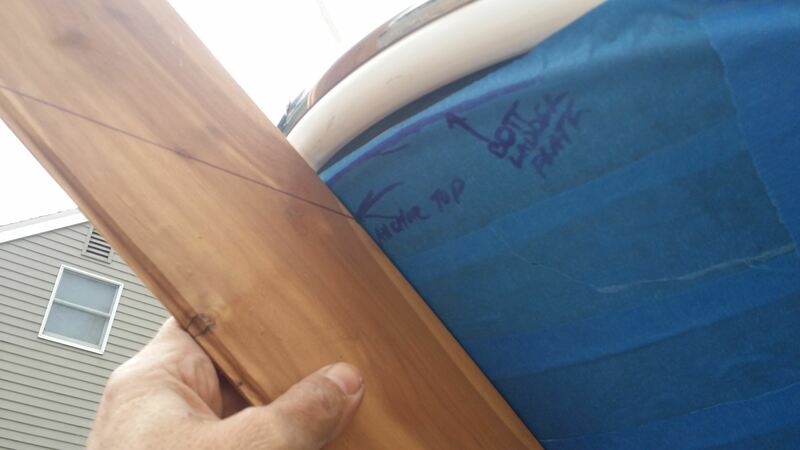 Take a center punch and punch the bolt holes on a soft pine board for the bolt holes. Because the foam STILL has adhesive on it where the holes are needed to be enlarged ? You must RUIN the sticky adhesive. Before enlarging the hole . If that is needed. It Should NOT BE NEEDED. Some oil on the foam & S S bolt should spread the hole easily & squeeze the gasket nicely with no goopy stuff. Edit www.mcmastercarr.com sells all kinds of closed cell foam with adhesive. No minimum order needed C C is fine. Thanks. I just kept telling myself it's only a boat. That's funny. I hope you didn't hurl a bunch of lucky charms all over the place. Yeah those guys are just a bunch of millionaires playing a kid's game, we can't expect much more from them lol. I think it was payback for Giancarlo Stanton who was playing the same thing at Fenway in game 2 of the division series. Children. ﻿ For the back of the roller plate. That is the out side shiny one ? I would not use anything gooey that firms up at all. Removal WITHOUT bending that plate up would be pure luck. Scratching the hull with screw drivers & pry bars is a real possibility. Clops, once that thing is permanently installed, it is NOT coming back out, ma bro! That's the whole idea. I don't really need to use 5200, I just have a bunch of it so might as well use it. All I need is a good bead of a decent sealant all around the inside of that flange enough to create a gasket of sorts. Check out the way Chaparral installed the boweye at the factory. Look at the amount of 5200 they used on that. 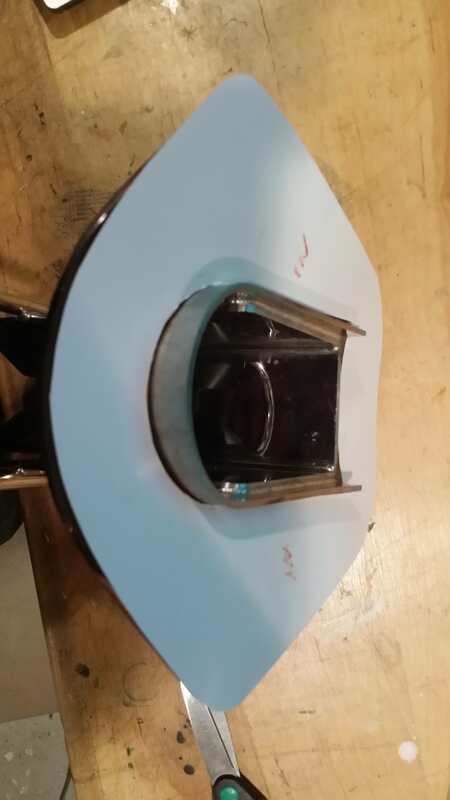 Granted between the lower white hull and the top black hull, the black bumps out or flares out compared to the white so that boweye flange can't sit flush on both surfaces unless it's shaped that way and Chaparral isn't going to do that since they use off the shelf parts for these things. But this is an example of using the goop for these types of plates. The inside bolts and plates and clip to the anchor line are all part of the washer plate that holds this bow eye in is also filled with goop. I don't have surface level differences for the bow roller like at this area so I'm going to make sure that plate sits a lot better than this. At least I hope! I would buy a piece of closed cell, I side ONLY, adhesive backed ,gasket material. That will allow simple easy on & off removal at any time . Small pilot holes in the gasket bolt places should seal around the S S bolts going thru it. It comes in loads of thicknesses & stiffness. Ick your color. Thick the foam onto the back of the plate first. Stick it to the center of the plate BACK SIDE, FIRST. Then slowly peel the paper off as you work the gasket outward. Then trim the edges. 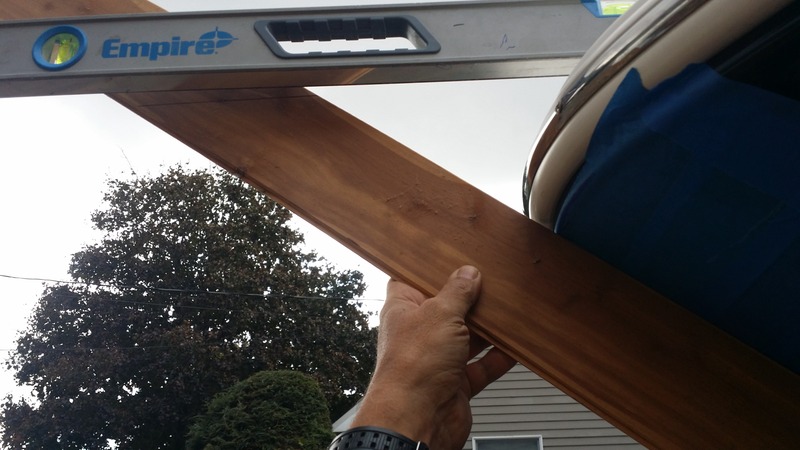 Take a center punch and punch the bolt holes on a soft pine board for the bolt holes. Because the foam STILL has adhesive on it where the holes are needed to be enlarged ? You must RUIN the sticky adhesive. Before enlarging the hole . If that is needed. It Should NOT BE NEEDED. Some oil on the foam & S S bolt should spread the hole easily & squeeze the gasket nicely with no goopy stuff. Cool site. I like the idea of the black foam gasket. I'll take a look at that for sure. Thanks, Clops. Very nicely done Hatem, it looks like it came with her from Chap. Are you wired yet? When people comment on it, you will be able to say with pride, I did that. Not to mention you have a new toy to play with, and believe me, you are going to love it more and more every time you deploy and retrieve it. Denny. Thanks, Denny. I'm all ready to go. Got my platform all cut and routed and drilled with the windlass dry-fitted into it and all the custom-made wiring from our mutual friend @ Anchorlift etc., but I've ran into a snag with that roller plate. I thought I could bend the flanges to fit the contour of the 276 but there is no way on this green earth I can do it. That 1/8th welded stainless steel is harder than anything I've encountered before. Granted I'm not a metal guy, but I've worked with aluminum and iron and have done some welding on steel but nothing of this intricate level. I even took my shop vice to the jobsite, drilled holes into a steel beam we propped up last week and mounted the vice on the beam and put this thing in the vice and jumped on it with all 195lbs and nothing! It wouldn't budge lmfao. Oh man. I even put a sataline torch to it without burning it up to soften the welded joints or the flange itself and nothing! Not even a millimeter of movement. I have to take it to a steel fabricator and have them knock out the welded joints and remove the plate from the rest of those fixtures on it, then flatten the plate out to the shape of the 276's bow and then reweld the SS back on and then polish it back to a mirror finish like it currently is. Someone on another forum told me that might cost as much as the thing itself lol. I said I hope not! That was $800 for just that roller plate. Hoping the reworking is much less than that, and I think it should be. I'll keep you posted. Just FYI to others who want to do this; the contour of the 277SSX is much sharper than our 276SSXs which is presenting this problem. We have a wider flare at the top there. Either that, or I was sold a roller that was fabricated incorrectly. That is a possibility but hard to tell unless I can compare it to one on a 277SSX. So if you want to do the same thing, keep that in mind. This is what it looks like on the 277SSX and hopefully what it will look like in our case when it's finally done. This is how much flattening needs to be done. 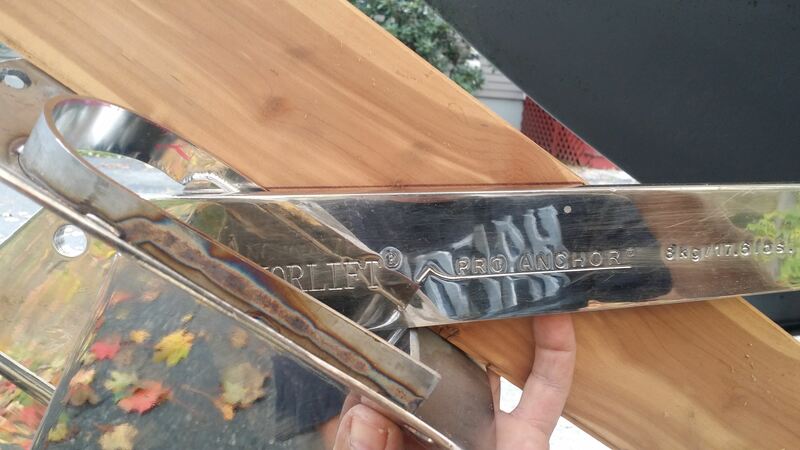 You are right about the separating of the plate& bracket. No way anyone can get a contour change when together. The separation needs a great mechanical guy with a very thin cutting disc. Have to carefully decide which gets .cut. Then a grinding of the 2 vertical curved plates to the new shape is done. A dry fit is next make sure it all fits into the hole. Hopefully the S S pieces are MAGNETIC. That will allow a easy Tack welding without melting the gel coat. Yes there are steps to go. You are doing great. Think 7 times on each step. Will save needless. DAMM IT ! When you build a prototype (like you are) you will run into a lot of unknowns. Believe me I know, when I did my heater/air conditioner the first thing I did, was to buy the unit and then I said, lets see if I can make this work. Talk about an adventure into the unknown. The end reward will be when it all comes together, and you get to play with your toy. Stay positive, you'll get over the speed bumps, one at a time. Denny. How much space do you have to make up around the edges? Could you make a gasket type filler out of a clear or black laminate, and shape it to fill the gap? You could also get some sort of filler material that you mix with a hardener, and form your own gasket. Just throwing out some other options, that's the body man in me. No matter which way you choose, the main thing is, that it looks like it came that way. Denny. You are spot on with everything you've said so far, Clopadopadus. Someone else said the same thing about running the plate through a roller will be the way it gets flattened out. I usually go with the rule of thumb that if 2 or more "knowledgeable" people say the same thing, it's usually the right thing! He also said to bring the boat there like you did haha. That's the best part of going through this kinda thing is when the advice is constant, that's almost always a good indication that it is, in fact, the right advice. I'll either bring the boat OR... I was thinking of glassing a template of the exact area and have them use that instead of lugging the boat around. Tape a nice, flat sheet of 4mil plastic on the bow, outline the exact position of the plate where it sits on the cutout, cut a piece of 1708 to the exact shape of the plate, put it on the plastic location over the bow and glass it in place. 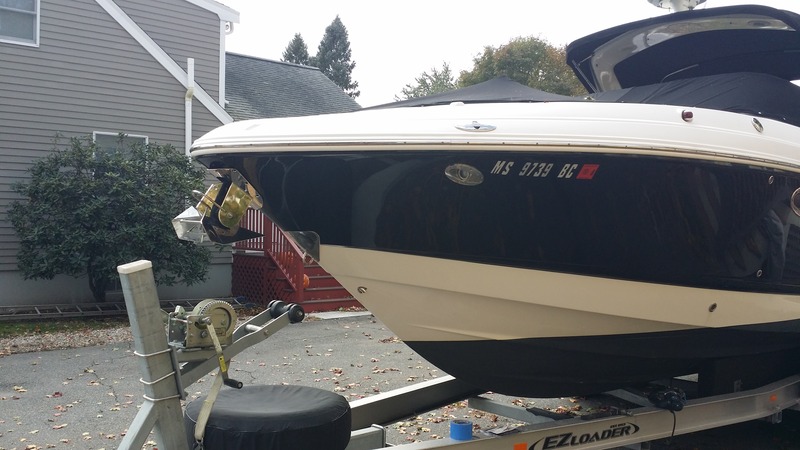 The glass will make the piece of 1708 stick to the plastic and not the boat's gelcoat and stay in place. Once it's hardened, I should have the exact, finish shape of the contour for the plate and just give that to the metal guy instead of bringing the boat there. As long as it's within 1/8" to sitting flush all around, I'll be perfectly happy with that. I'm thinking they might insist on bringing the boat there, we'll see what happens. DAMMIT! At least this wasn't a surprise to me. I knew I had to deal with this once it arrived to the house and I opened it up and put it in place. Even without the hole cutout in the bow you could tell it wasn't going to sit flush and that I would have to deal with it at some point. My bigger concern was getting the cutout in the right place to make the ladder work also. That was actually a bigger challenge to me. This here is just a matter of finding someone who can and will do a good job on reshaping the plate. BUT, I was also told by several metal guys that stainless steel -- out of almost all metals -- has the most aggressive memory and wants to spring back to its original form more than others types of metals. I guess the trick will be to drill the bolt holes ASAP and install it quickly once it's finished so that helps keep its shape and prevents it from springing back. Although the way its welded to the roller bracket and that inside flange, I think it would be hard for it to spring back once it's rewelded. The risky time is from flattening the plate on the roller to the welding of the roller brackets is when it will be tricky Vicky. I remember that project was awesome. @Dennis A was a great help with that IIRC. 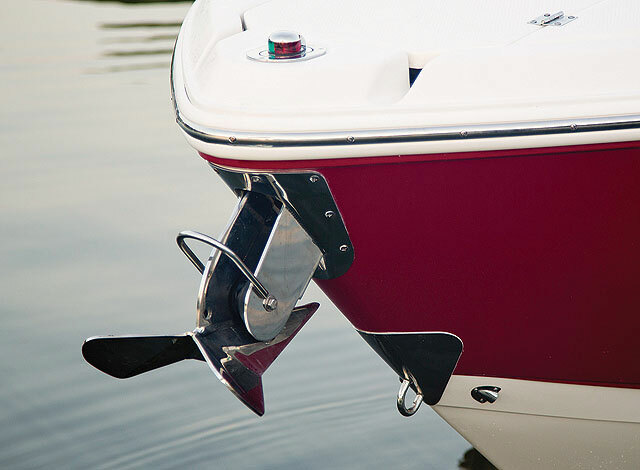 I actually just ordered the bow thruster I'm going to install. Talk about an adventure into the unknown lol. 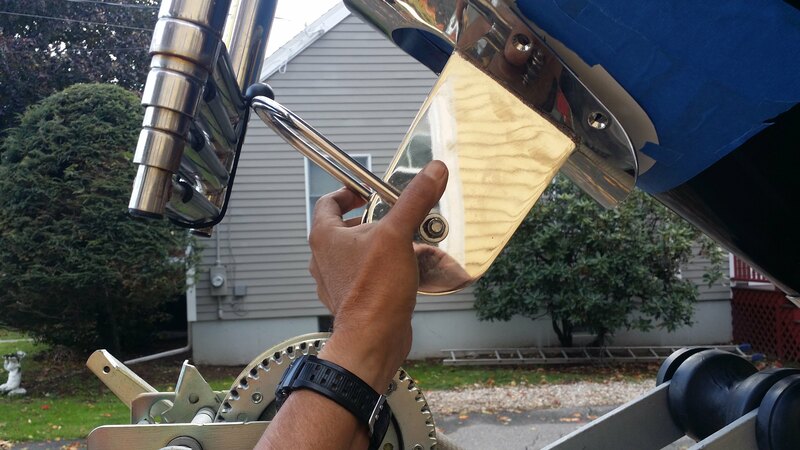 That's gonna be a lot of fun because it's MUCH more difficult than this windlass installation and will help power the bow. So the results are much more satisfying in this case. A lot of fiberglass work aside from the tunnel because I have to cut an access panel in my forward ski locker to do this, then finish the inside of the locker with an access panel and smoooooth gelcoat. Fun fun fun! 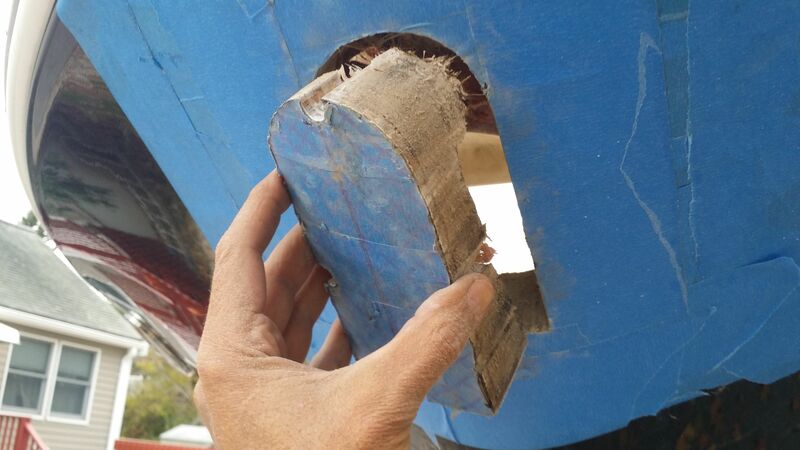 So the outside edges of the roller plate have to come out, or flatten the radius a total of about 3/8" - 1/2". It's a considerable amount TBH. You can see how far out it sticks in one of those side pics with the yellow house in the background. 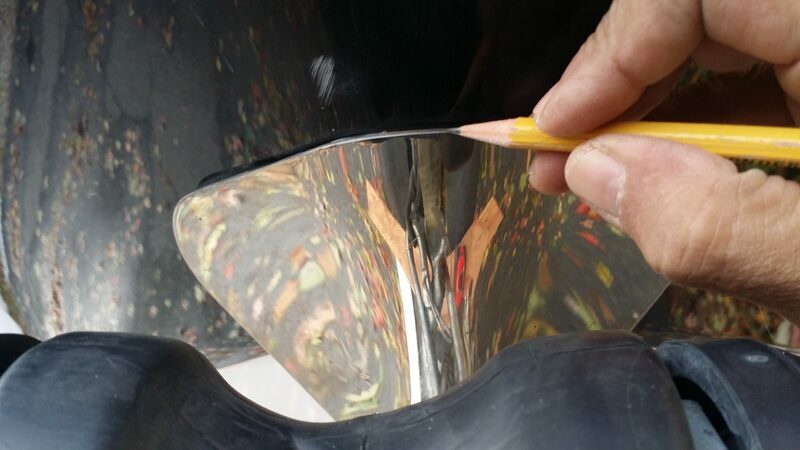 Center point of roller plate is off the gelcoat surface by about 1/2". So it's almost like you need to step on the plate to push it down. I could use a filler of some type but as you well know, we're finish guys here who've been building custom homes and restoration projects and carving realistic raptors for many, many years and so it's always about getting it as right as humanly possible. Yep, you are correct, sir. Between you and Clopadopadus, what are we talking about here, 160 years of experience? Something like that, right? You see, there is some positive to look forward to with the inevitable fact of aging. You become an encyclopedia of knowledge. 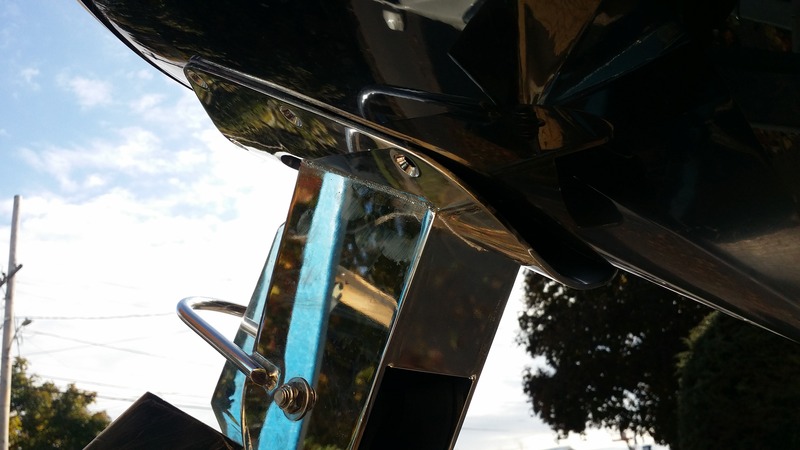 Is it chrome plated or polished? Seems like a dumb question, but many are platted because stainless is a very grainy material. No memory per se, but stainless is harder than h-e-double hockey sticks and is very difficult to weld and tends to distort. Pre-heating is required get the weld to “stick”. Assuming polished, polish, polish, polish. Lots of labor. Love the template idea. 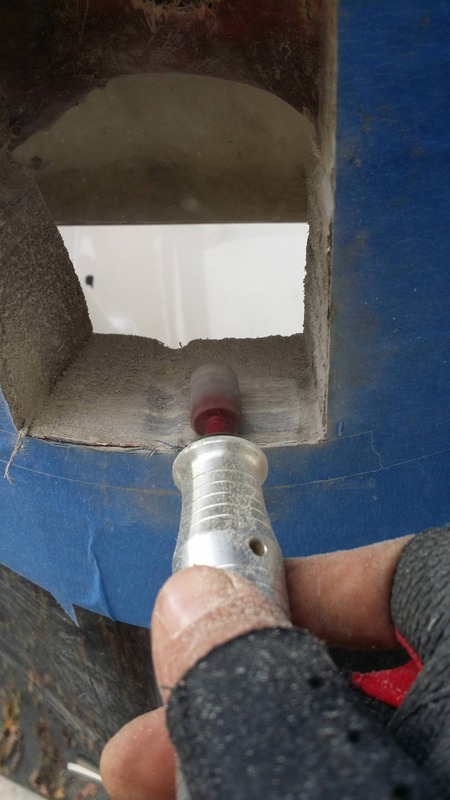 At the end of the day, if you want to use the existing part, an oxy-acetylene torch, a tempering oven, a heavy hammer, wood timber base and skilled hand will do the trick. Two things to think about. Call the manufacturer and get the grade of steel used. This will help the shop doing the work a lot. Second, perhaps they’ll make you a custom, using the template, and also take this one back provided you give them some extra $. They are equipped to do this. If that doesn’t work, PM me and I’ll provide a few references for shops that do great stainless work. 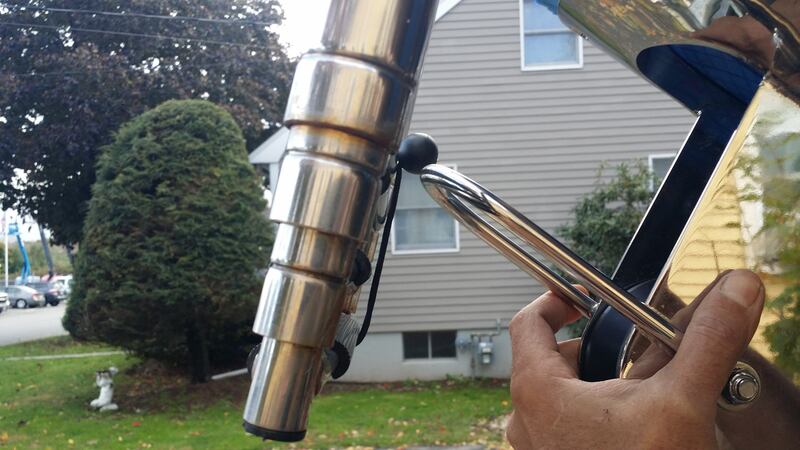 Alternatively, and fortunately you’re in the Boston area, go to a few stainless prop repair shops - they’ll have the equipment and skill for this. Keep in mind, stainless is a material many general metal shops can’t do (and readily admit) and/or some think they can do, but in the end can’t (part looks terrible, weld is awful, etc. ; remember, the weld must bond the pieces together structurally and must also look great - this is an appearance part). Can’t wait to see this finished. It looks great, and the work you’ve done is fantastic. Also, can’t wait to see the bow thruster. After the anchor & bow thruster ? 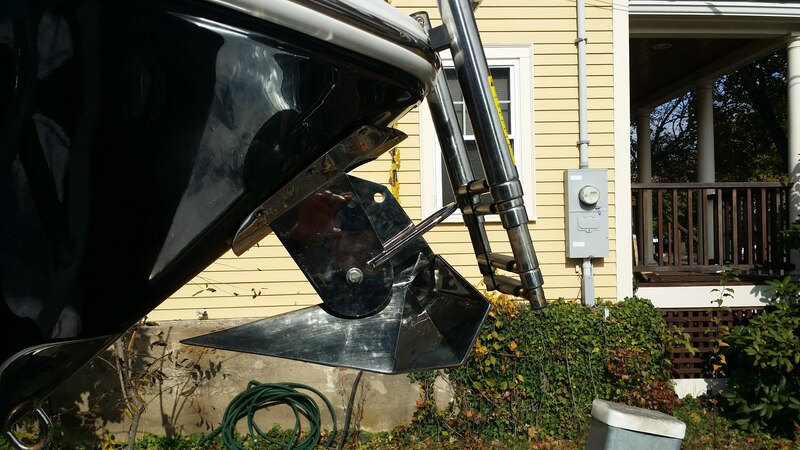 Install a bow thruster in the stern. A friends new old wooden Mahogany 33' runabout has a stern thruster. SO SWEET in winds. 1st time every time. It is so UN event full to dock a normally undersized rudder boat. The rudder is 7 X 7" . A total useless joke in any wind and current.